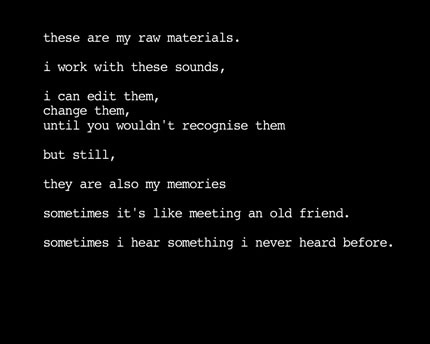 The protagonist of "Raw Materials" a video without images, only sound and text, types a letter while listening to sounds from his archive. He plays a memory game with himself and the audience, implicating us: "Do you remember? You were there too." He analyses what it is possible to hear in sound recordings. Can they replace memories or photographs of places? Can they convey time, temperature, weather or emotions? How much do we project our own memories onto these sounds, and how much do the words colour our judgement? 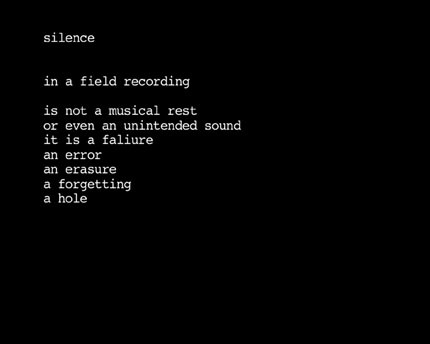 Can we listen to a sound archive as a personal diary, as fiction, as music or as legal evidence? Is the maker a listener, an actor or an author? Why did he record these sounds in the first place? And which tapes did he erase, and why?